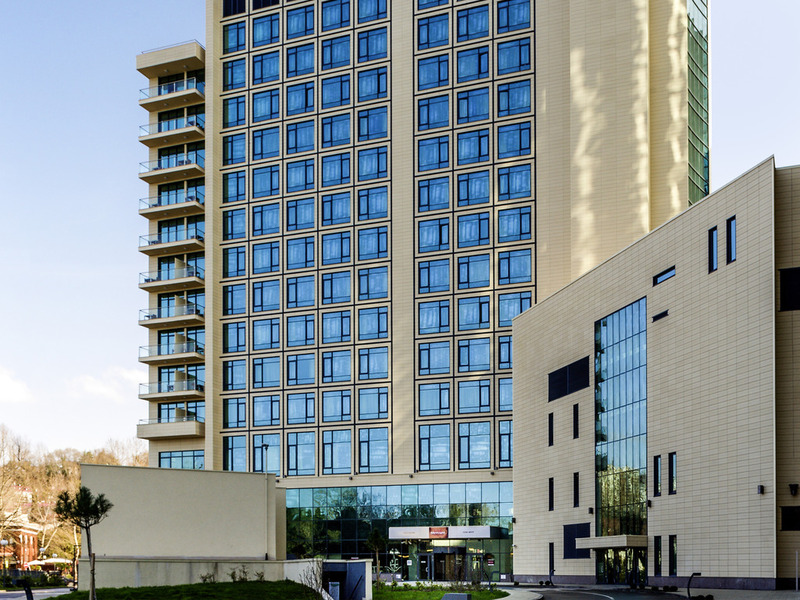 The Mercure Sochi Centre hotel is located in the heart of the city on the Black Sea coast. Relax in one of our 200 spacious rooms (non-smoking) after a long day at work. Enjoy the sophisticated contemporary design, excellent views of the city or the sea, and first-class service. The hotel's beach facilities and outdoor swimming pool are open during the summer season. The Mercure hotel is located within walking distance of the water park, sea port, concert hall and Winter Theater. The 4* Mercure Sochi Centre hotel is located in the city center on the Black Sea coast, within easy walking distance of all amenities. It boasts a contemporary design, private beach and outdoor swimming pool (seasonal). Free underground parking available. The "Lace" restaurant serves dishes inspired by local culinary traditions and modern trends. Wines from our "Flavors from the cellar" collection are the perfect complement to any dish. The relaxed atmosphere of the lobby bar creates the ideal setting for entertainment and relaxation. You can also enjoy our full range of dainty snacks and cocktails.